Decorate with black. This Cambridge Noir Lined Empress Swag showcases a medium scale contemporary floral and vine pattern boldly colored in shades of blue, yellow, rusty reds, and green, against a rich black ground. Substantial in weight, this lovely swag treatment is printed on an all cotton fabric and is fully lined. 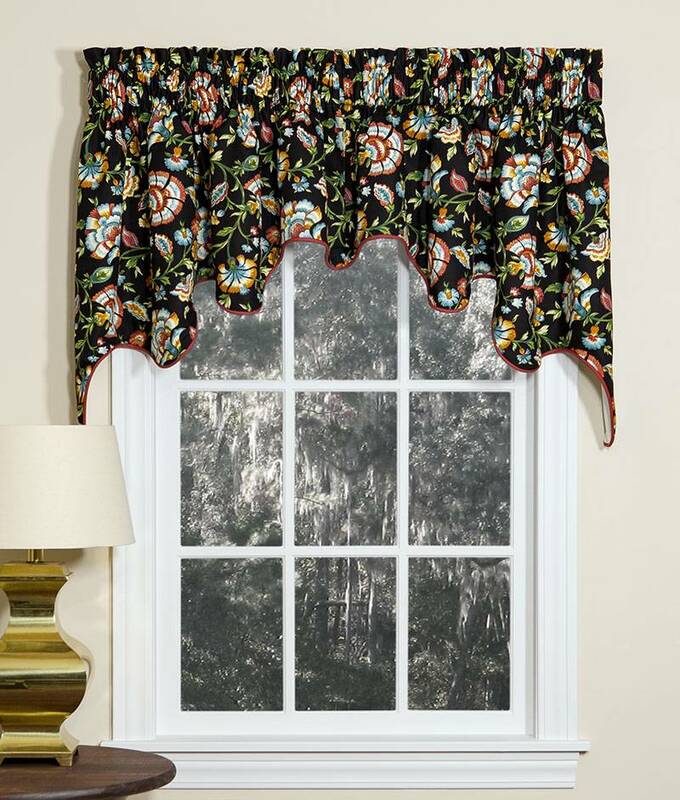 This versatile and stylish swag can be hung alone, as pictured on the left, or combined with Cambridge Noir Lined Empress Filler Valances (sold separately) to cover wider windows. (Insert filler valances between the right and left swag panels.) Handcrafted in the USA, this stunning swag treatment has a rusty red solid color accent piping running along the gracefully scalloped bottom.